A rabbi walks into a burger-and-steak spot. It’s Char Bar, a kosher establishment for steaks, burgers and deli sandwiches, now open downtown just in time for Yom Kippur. If you’re looking for somewhere to break fast on Saturday, well, they can’t help you. Because they’re closed on Saturdays. Of course. 1. It’s a casual-looking place. Some stone on the walls, maple butcher-block tables, ceiling fans overhead. (See it here.) Nice enough, but maybe not a date spot. 2. You can get a burger with sliced ribeye on it. Or another with grilled pastrami. One thing you can’t get on it: cheese. 3. 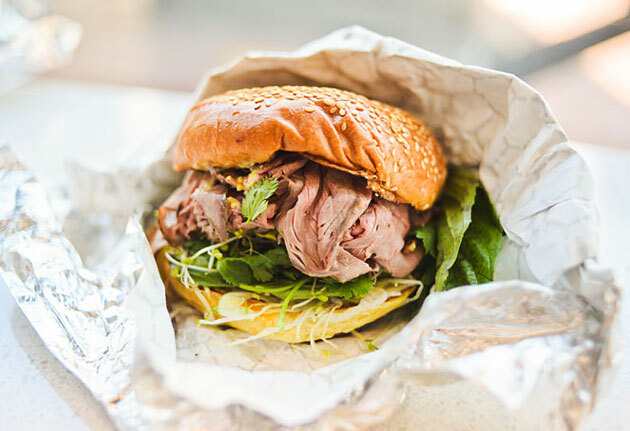 Coming in a couple weeks: Eli’s Market next door, a grab-and-go setup for sandwiches, pickles and such. And in a couple months: kosher wines from Israel and kosher beers. 4. There’s a table in the corner with leather armchairs. It’s reserved for rabbis. Best rabbi-only corner table in the city.